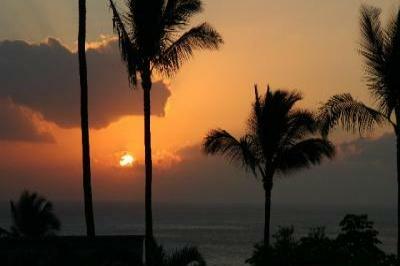 A nightly treat from YOUR lanai at Wailea Ekolu! and sea, all of which are visible from every room in your condo. including granite and tile in the kitchen and bathrooms. living room to accommodate an additional two guests. the neighborhood conch blowers pay homage to the perfect sunset. watching in the entire state. towels, a sun umbrella and coolers for your days at the beach. photo tour, live sunset webcam to see YOUR view before you check in. -Washer & Dryer: We have included a blow dryer for your hair too. -We have included an iron/board for your Aloha shirts and dresses. ESPN Discovery National Geographic and local network channels. -DVD and VCR along with several VHS and DVD movies. need to enjoy cooking at home. short walk from your front door in the complex. -Lanai: The master bed room has its own private Lanai too.